Currently showing in cinemas nationwide, the movie ‘Up North’, produced by Anakle Films and Inkblot Productions, is an ambitious, genre-defying project which aims to pack comedy, romance, and adventure into a big budget Nollywood strip. For its main appeal, this movie contains captivating portraits of places and landscapes but struggled to mark a complete break from existing narratives. 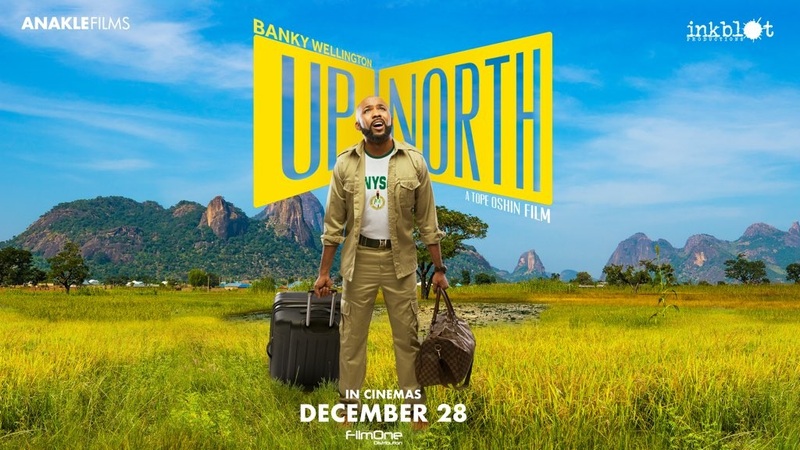 Directed by Tope Oshin, ‘Up North’ follows the story of widely beloved Banky W, hence known as Bassey, an engineering graduate from MIT, fitness nerd, and imminent CEO of Deon Constructions, but who in his millionaire father’s estimation, remains deeply irresponsible. Bassey, unlike his genial older sister, Idara, (Michelle Dede) is seen to be petulant, and in one early scene barging into his father’s office stone-high, clearly unready for the leadership role ahead. As a corrective, Bassey is sent to endure the compulsory National Youth Service Orientation camp; worse, in a state up in the country’s northern region: Bauchi. Despite initial shock and reluctance, Bassey turns up oddly adaptable, and quickly establishes a friendship in camp against the odds. In a more dramatic twist, Bassey becomes unwilling to ‘redeploy’ home to a lucrative offer to pursue a business merger and public listing for Deon Constructions – also underlined by a potential arranged marriage for him. Instead, Bassey, now fully of Bauchi, is conceived to be established in his new life, and ‘place of primary assignment’ as a school teacher. Living ‘Up North’, he grows his following on social media through a documentary vlog – and really for being smoking handsome. Still a fitness nerd, and regular street runner, Bassey finds himself encountering and skipping many hurdles in his Northern adventure. He put together an athletic team; fell out with parents within the community; and at the same time gets caught up in romantic tension with a co-worker at the school. Crucially, for Bassey, who is a stand-in for the average Nigerian consciousness, going ‘Up North’ is not only eye-opening; but turns into a redemptive experience. In this alone, some of the undercurrents in the movie become, perhaps, apparent. The north of Nigeria rarely comes alive on the big screen on the scale projected in this movie; when it does appear, in both popular and film discourse, the region is typically crudely represented as dusty, dry, and politically volatile. ‘Up North’, and its stream of scenic shots, which combines sweeping aerial views of beautiful landscapes and magical tourist sites, then, perhaps represents a necessary intervention, an alternative reality, as if to say the North is a lot bigger than you think you know. From the moment Bassey and his friend are cleared to serve in the girl’s-only high school, ‘Up North’ introduces the viewer to a unique Northern festival and massive fanfare at the Emir’s palace. Camels strut through a mammoth crowd; gun shots echo celebration in the air; and native musicians sing and play local instruments to create a feverish atmosphere; a pure African spectacle. However, in taking the manner of a tourist flick, this movie’s focus on the aesthetics of the North fails to dispel the stereotypes about her people, unreflectively wading through clichés. The parents of the school girls where Bassey served, for instance, are still somehow incapable of reconciling a combination of classroom learning and extra-curricular athletics. It takes the intervention of Bassey, rich, sophisticated – and presented in the full glare of a savior-settler – to get an obvious point across through the local ‘Sharia court.’ In ‘Up North’, the script seems to say, that ordinary people may not reach a compromise over a simple disagreement. More tellingly, as if to underline a directorial bias, Bassey has been magically reinvented on Northern turf as the defender of the girl-child, possessing an uncanny touch, going as far as winning a state competition with a make-shift team. The odyssey of Bassey ‘Up North’ is sweet and maybe saccharine. And here, even when ‘Up North’ did not present the classic dilemma of the tale of the hunt, one still feels that the charity showered on Bassey has not been evenly extended to his local hosts. Nonetheless, save a critical discomfort, ‘Up North’ is an enjoyable flick, and the crew and most of the actors deservedly earn their payday. There is a moment of old Nollywood nostalgia with actors like Kanayo O Kanayo and Hilda Dokubo, Banky W continues to be Nollywood hearthrob; Michelle Dede, on the strength of her performance, makes a strong case for more regular features; and Ibrahim Suleiman, in his debut on the big screen, leaves an impression on the audience as the fun side kick. Ultimately, ‘Up North’ would linger in the minds of film-goers as a tribute to the mythic beauty of Bauchi, its stretch of waters, rocks, and games park, and as a milestone in Nollywood’s recent rallying as home to the finest cinema entertainment on the continent and beyond.